Here it's cold and wet, been raining most of the day and it's very windy, a bit different to yesterday. Kelly phoned to say about all the schools that were closing or closed around us, but where her lot are was not. I know they have to think about their staff as well as pupils and how far they have to travel when making the decisions, still OK round here just heard the bus pull up and it's on time so no hold ups yet between us and Haverfordwest. When I looked at the weather app I've got for round here it forecast the snow about 6pm, just when we're going to have our evening meal so hopefully I'll be able to cook it with no power loss, fingers crossed. Fingers crossed that you have a warm house, plenty of power and a wonderful tea.... this was the post I made yesterday but for some reason didn't post it. I hope the weather has settled down for you. Can they not cut the tree that you mentioned? Han was back in yesterday and again today although when I looked out this morning, we had fresh snow on the ground and then it started snowing again. They cancelled all the buses the other day until late morning, and I know there have been multiple accidents on the motorway. I'm just really pleased at the minute I don't have to go out in it. Well Andy, the owner of next door, was still waiting to hear back from the electricity board about it. Trouble with them is that if it's not touching the wires they don't want to know, they did chop a few branches off last year that were looking a bit too near the wires. As I said in another post we had a light dusting overnight but not much and it soon cleared when the sun came out. John went out but only to the next village to get a few bits. At least now we don't have to go out to put money on the meter for the electric since they fitted a smart meter for us, I can just pay online and it's showing added to the meter within a few seconds. Well today I've got a new toy to play with, just arrived in the post is a pen mouse. I'd seen adverts about them before but they were a bit expensive. I've bought a few things from JML online and get emails from them about new products etc. Got one the other day about this pen mouse so thought I'd try it out, so far so good, it's taking a bit of getting used to making the left click button just right but it shouldn't be too long before I get it right. 1 end is the normal mouse operation but you can turn it round and use the other end as a stylus. This laptop is touchscreen and I got a pen with it but that can only be used to write on the screen whereas this pen does both mouse action and touchscreen use. It came with a holder for the desk so at the moment it's sitting in that while I'm typing but when I want to use it I just roll it over the arm of my chair, you are supposed to be able to use it up to 10m away on any surface. I doubt that Bill, I'm sure you'd manage with no problem. It's possible I'll be sending this one back as the left click button is a bit dodgy it's not very workable keeps locking up and you can't use it. Are you going to order a replacement? I'm still not sure from your description that I have the correct picture in my head of what it looks like. I've just ordered a 6 in 1 cake/punch/salad bowl thing, so I'm waiting for that to arrive tomorrow. I ordered a different one before Christmas but was told that I would have to wait a month for it, and it was more expensive, so I cancelled that and ordered a much cheaper one instead. I'll probably ask for a replacement as it may just be a bad one, but I've ordered one from Amazon so if the replacement is the same I've still got one, but if it's OK I've got a backup, you know me and my backups. Ooh, I'm not sure if I could use one of those. Does it not feel bizarre to use? A mouse is usually wide, so I'm not sure I could get used to using a slimline version. There's nothing to grab hold of. Lol, I know you and your backups, you've got two of everything! No it feels fine, just like holding a pen, I'm using it now as the buttons working at the moment, you watch it'll go dodgy again now I've said that, the one from Amazon will be here in the next hour. Oh! and some things I have more than 2 backups, lots more. This is the one that came today and it's so much better, at least the button works. 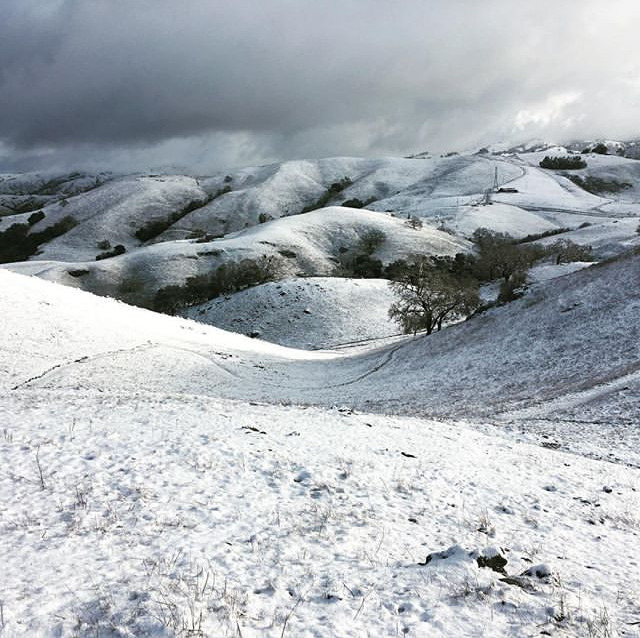 Everywhere hillsides and mountain peaks rise above the landscape, there was snow to be seen around the San Francisco Bay Area. Glad to see you don't have the snow around your way Bill. Phoned the place where I got the Pen Mouse from yesterday and the representative was very friendly and helpful, gave me the Freepost address to use to send it back and will arrange a replacement and quite understands that it will also go back if the same thing happens, she said it's a new product for them so had not had any feedback about them yet so mine was valuable to them. John took it to the Post Office for me today so he could get a certificate proof of posting. This is the one that came today, and it's so much better, at least the button works. Oh dear me, when the picture first appeared on the screen, I wondered what on earth you had posted! Glad it's working properly, and you're all sorted. Are you a hoarder Joan? I bet you could start your own eBay store soon with all your extras and backups. Do people come to you for spares? I got the delivery of my cake stand on Monday and then had to send it back yesterday because the plastic seemed to be scuffed and worn. It was still new, but the plastic seemed to be ingrained with scuffs so unfortunately, I sent it back. The problem is now I'm trying to work out which of the replacements I'm going to buy instead. The weather here has gone to a mild state but John says we need to batten down the hatches for the weekend. I'm hoping it'll pass us and stay as it is. I wouldn't say I was a hoarder but living where I do and not being able to get out these days I hate to think that if something broke etc. I couldn't just nip out to the shop or store and replace it straight away. As for the shopping I only buy when things are on offer so I have a supply to keep me going when the price rises again, they quite often come back on offer after a few weeks. I have my meals planned for the week because I only shop once a week so have to make sure I have enough supplies to last a week. I bet you have a serious treasure trove of gadgets and everything in that spare room of yours. If the baking utensils you have spare are anything to go by then I think you should open your own online store. Since we got the magnetic meal planner that sticks to my fridge, I'm now more organized with teas for the week and buy accordingly. It also helps Han out when she's at school for her dinner (this is going to confuse the hell out of Bill ) because she can choose something that we won't be having at teatime. I try and complete the planner on Sunday that way we know what we're having for the week. Sometimes we don't always stick to it but it helps when buying the shopping also. Back shortly off to see a man about a job. I'd probably surprise myself if I listed it all, I mean I've even got backups of the backups. Kelly's lot take a packed lunch that way she knows what they're eating and she packs healthy items for them. It's too expensive for her to let them have school dinners, the only time they do is Christmas. My meals are listed on a calendar I have that is fastened to a cupboard door in the kitchen, the fuel company provides them each year free, they have a month at a time with a gorgeous scenic photo of somewhere in Britain on 1 page and then the dates are in boxes that are big enough to write in.